Strolling the heifers in Brattleboro. Homemade costumes in the Mardi Gras parade in Eunice, Louisiana. Parading through the encampment in Crow Agency, Montana. In Brattleboro, even those who don’t like dairy have a place in the parade. Kids share a laugh before the Crow parade in Montana. 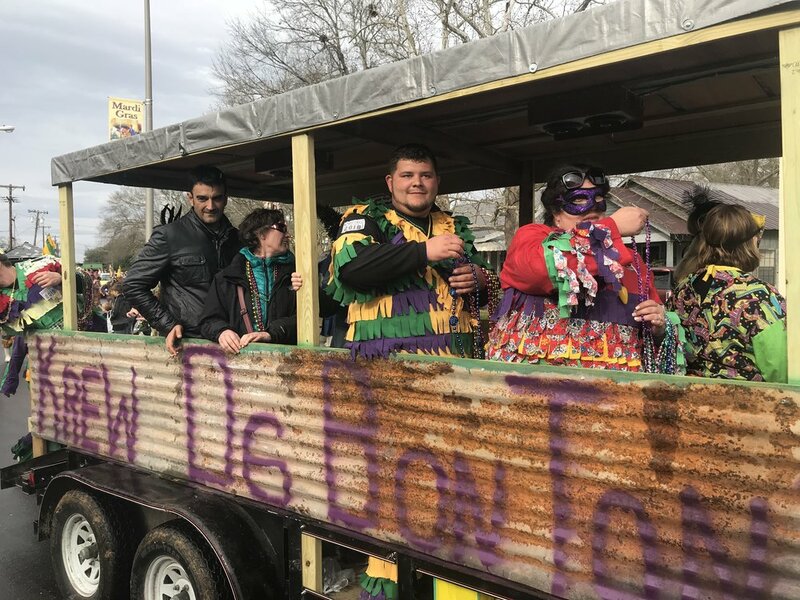 A “krewe” float in Eunice. Brattleboro, Vt. – There’s something special about a parade. Here in Brattleboro, the big parade is called the “Strolling of the Heifers.” Dairy cows and their proud owners lead the way, recreating the daily trip up Main Street farmers used to take to bring their cattle to pastures north of town. This year’s parade had a Star Wars theme, with a heifer dressed as Princess Leia, stormtroopers among the marchers and the high school band playing the Darth Vader theme. “May The Farms Be With You,” its posters proclaimed. In Eunice, Louisiana, it’s the Mardi Gras parade, which carries a Prairie Cajun flavor. Marchers wear homemade costumes descended from European village festivals. They ride horses, and sometimes carry chickens. Louisianans love their parades. In big cities and small towns, social clubs – called “krewes” – plan all year for their Mardi Gras parades and balls. In Crow Agency, Montana, every day of the Crow Fair starts with a parade through the encampment on the banks of the Little Bighorn River. Tribe members dress up in their best outfits to ride their horses past spectators in lawn chairs set up in front of teepees. Parades have been going on since ancient times for purposes you might call political. They were organized by the state to please a monarch or to intimidate his enemies through the display of military might. Military parades brimming with sharp-stepping troops and war machines are still common in other countries, and President Trump has ordered one for Washington this fall. There’s a place for politics in America’s parades. Labor Day parades, for instance, started as protest marches. In the nineteenth century, torchlight parades were a common campaign event. I like it when candidates march in parades, surrounded by sign-carrying supporters, as long as they walk the entire route. I’m OK with big parades, though watching a parade on TV seems to miss the point. But I like the smaller parades best, parades with local character and local characters. I like parades put on by people who like to dress up and show off, purely for the entertainment of their neighbors. The best parades paint a picture of the local community. They spotlight local industries -- like the Brattleboro parade’s affection for dairy farms – and local organizations. They celebrate local history and culture, like the parades in Louisiana and on the Crow reservation. I like parades small enough that people in the crowd can shout greetings to friends who are marching, parades that force people to look up from their phones and see the faces of their neighbors, where people can renew old acquaintances and make new ones. A real community is defined by proximity. It’s the people who share a common place and the responsibility for making it work. A local community is like your family: You might not like all of them, but you’re stuck with them. Might as well get to know and respect them, and a good place to start is by sharing a parade. If it’s a real community parade, everyone should be able to march in it. That principle was tested after organizers of Boston’s St. Patrick’s Day parade refused to let a group of gay and lesbian Irish-Americans march. Both sides refused to budge, and the case went all the way to the U.S. Supreme Court, which ruled in 1995 that the organizers were a private group which had the right to control the sentiments expressed in their parade. Gay rights advocates didn’t like losing the court case, but the ruling protected their speech as well. The organizers of gay Pride events don’t have to worry about being forced to let the Westboro Baptist Church or some other hate group spoil their parade. But it doesn’t take a court order to get a community to let all its members into the parade. Last year, after the state’s leading politicians threatened to boycott the parade, the organizers reversed their position, letting a group of LGBT veterans march. Including everyone made it a better parade. Brattleboro had its own band of dissenters marching at the tail of its parade: Anti-dairy activists carrying signs reading “Humane milk is a myth” and “Milk comes from grieving mothers.” No problem: All views were welcome in this parade. Summer is the season of parades: Patriotic parades for Memorial Day and the Fourth of July; neighborhood parades that celebrate the culture of ethnic and national groups; small town parades featuring homemade floats, brightly decorated bicycles and lots of kids; Pride parades where local politicians and activist church members join hands with drag performers and go-go dancers.